Radio transmissions to the U.S. Coast Guard are usually calls for help from boaters, but one captain got on the radio recently just to say thanks to the men and women who are currently working without pay. "My name's Joseph and I'm the captain of a shrimp vessel, and I'd just like to thank you," the radio transmission began from a boat captain near the Coast Guard Sector Mobile, Alabama on Thursday. "Thank you to the Coast Guard who's working and ain't receiving pay. I'm sure I speak for all of us. We appreciate you guys being there without pay. It's nice to know we're out here at night and we can still depend on you." He added: "I appreciate it. Thanks. Thank you Coast Guard." The Coast Guard missed its first paycheck on Tuesday amid a government shutdown, now the longest in American history. 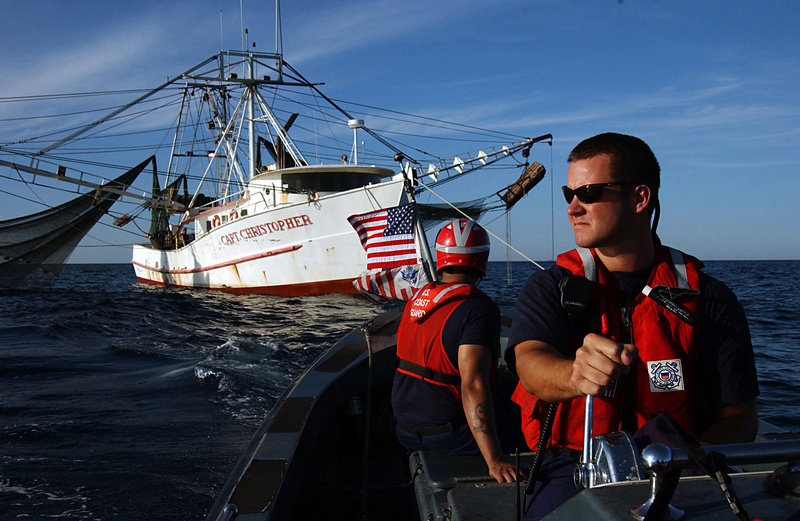 Roughly 40,000 active-duty service members are working without pay during a lapse in government appropriations for the first time in history, according to Adm. Karl Schultz, the Coast Guard Commandant. Some lawmakers have been working on a bill to pay the Coast Guard during the shutdown, which is still being negotiated. "We're making progress," said Sen. Dan Sullivan (R-Alaska). The transmission in Alabama was shared from the official Coast Guard Twitter account on Friday, along with the message, "thank you for your support, Capt. We continue to stand the watch at home and around the world." 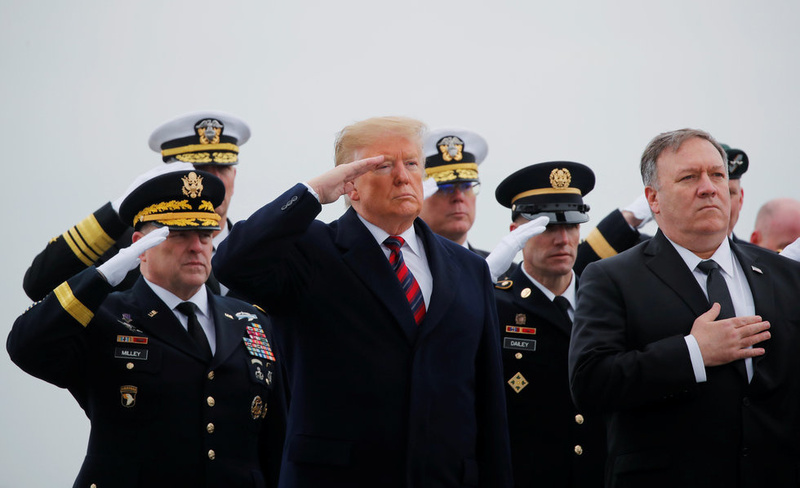 DOVER AIR FORCE BASE, Del (Reuters) - U.S. President Donald Trump traveled to Dover Air Force Base in Delaware on Saturday to receive the remains of four Americans killed in a suicide bombing in northern Syria. Trump, locked in a battle with congressional Democrats that has led to a nearly month-long partial government shutdown, announced his trip via a pre-dawn tweet, saying he was going "to be with the families of 4 very special people who lost their lives in service to our Country!" Trump told reporters on the South Lawn of the White House prior to departure that he planned to meet the families, a duty which he said "might be the toughest thing I have to do as president." He was greeted by military staff at Dover Air Force Base after a short flight from Joint Base Andrews, but did not speak to reporters before entering his motorcade. Flanked by military officials, Trump, Secretary of State Mike Pompeo and acting Defense Secretary Patrick Shanahan filed up a ramp leading onto a military transport aircraft, where a prayer was given to honor the memory of Scott Wirtz, a civilian Department of Defense employee from St. Louis. 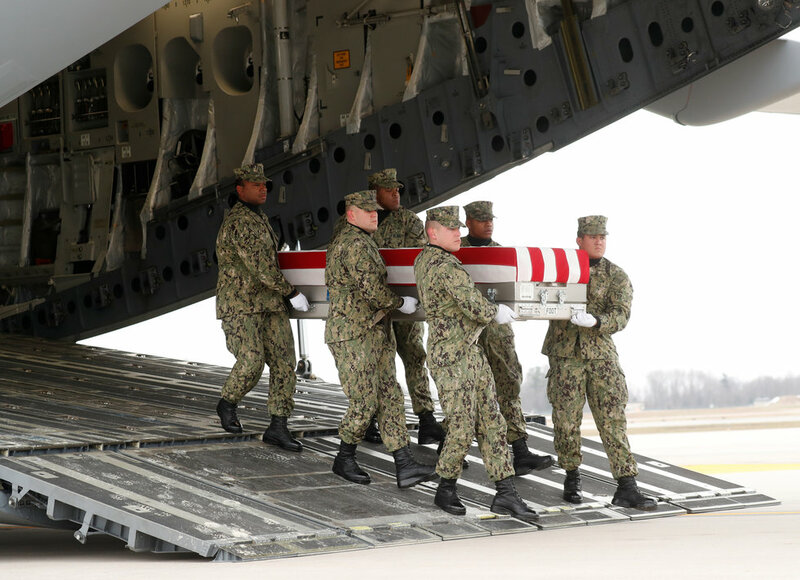 Trump filed down the plank and saluted while six service members clad in fatigues and white gloves carried an American flag-draped casket carrying Wirtz to a waiting gray van. The Dover base is a traditional hub for returning the remains of American troops abroad. The United States believes the attack that killed the Americans was the work of Islamic State militants. Trump announced last month that he planned to speedily withdraw U.S. troops from Syria, but has since said it does not need to go quickly as he tries to ensure safety of Kurdish allies in northern Syria who are at risk of attack from neighboring Turkey. Trump told reporters on Saturday that his Syria policy has made progress but that some work remained in destroying Islamic State targets. He defended his plans for a withdrawal. "It's moving along very well, but when I took over it was a total mess. But you do have to ask yourself, we're killing ISIS for Russia, for Iran, for Syria, for Iraq, for a lot of other places. At some point you want to bring our people back home," he said. In addition to Wirtz, those who died during the Wednesday attack in Manbij, Syria, were Army Chief Warrant Officer Jonathan Farmer, 37, of Boynton Beach, Florida, and Navy Chief Cryptologic Technician Shannon Kent, 35, identified as being from upstate New York, the Department of Defense said in a statement. The Pentagon did not identify the fourth person killed, a contractor working for a private company. U.S. media identified her as Ghadir Taher, a 27-year-old employee of defense contractor Valiant Integrated Services.